Prowling Amazon for daily free e-books, I discovered A Murder Moist Foul. 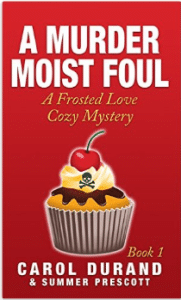 While the use of moist in a book title evokes either a bad erotica or worse, some sort of soupy horror novel, the second portion of the title, proclaiming this a cozy mystery, which upon closer inspection is revealed to rotate around one of my favorite guilty pleasures, cupcakes, was more than enough to tempt me. The second novel in the series, A Pinch of Murder, was also free, and it seemed like a good way to discover a new, promising series. All the five star rave Amazon reviews convinced me that not only must I download both books (which are now at $2.99 each and no longer free), but that I had to read them that night. What a mistake. What a painful, painful mistake. Over a month later (a pathetically long amount of time to slog through a 191 page, large font e-book) I did the unthinkable. I deleted the book from my Kindle. Removed it and the unread second novel in the series. I would not allow it to taint my ancient, black-and-white Kindle. The “plot” is little more than an outline with cavernous holes peppering stagnate script and characterization beyond insipid, racing through trite, and landing at terminally torpid. It’s a disgrace. Missy Gladstone, stereotypical beautiful, lonely blonde bombshell owns a bakery which sells disgustingly flavored concoctions. Mercifully, we spend no actual time with these steaming heaps of offal which pass for cupcakes. Missy’s sister was apparently murdered, something we discover more than halfway through, and when the local donut seller ends up offed, Missy is suspected by stunning yet emotionally aloof Detective Beckett. Missy is offended by Beckett’s chauvinism and her attraction to him. Meanwhile, Beckett is charmed by the feisty southern belle, but afraid of his own emotions . . . start up the violins, please. There is, apparently, an investigation, or there was supposed to be. There are some chapters where Missy, drawn with all the charism of a stick figure, tries to sort out who might be the killer, and she maybe even investigates almost. Frankly, it’s hard to tell exactly what’s going on, but who cares. It’s certainly not worth reading the confusing bits (i.e. the entire book). Finally, at the grand finale, a killer never mentioned in the story and a side plot barely articulated tie together when the killer proves conveniently stupid. How do all the elements of the murder, Missy, and the poisoned cat connect? Who knows. Who cares. The “novel” is mercifully over. Can we have a round of applause for that formal, stilted passive voice, for the numerous prepositional phrases strung drunkenly together like cheap Christmas lights, for the lack of proper paragraph separation, and for the very formulaic nature of well, just everything. Need I even address the lamentable creation of characters? This book actually reminds me a little of Sharknado. It seems, like the famous B-movie, to be highlighting and making fun of everything unrealistic, expected, and stereotypical within both the romance and the cozy mystery genre (which hey, is an achievement in and of itself.) Sadly, while Sharknado was so bad that it was good (and, very self-aware of exactly what it was doing), A Murder Moist Foul is so bad that it’s just bad.